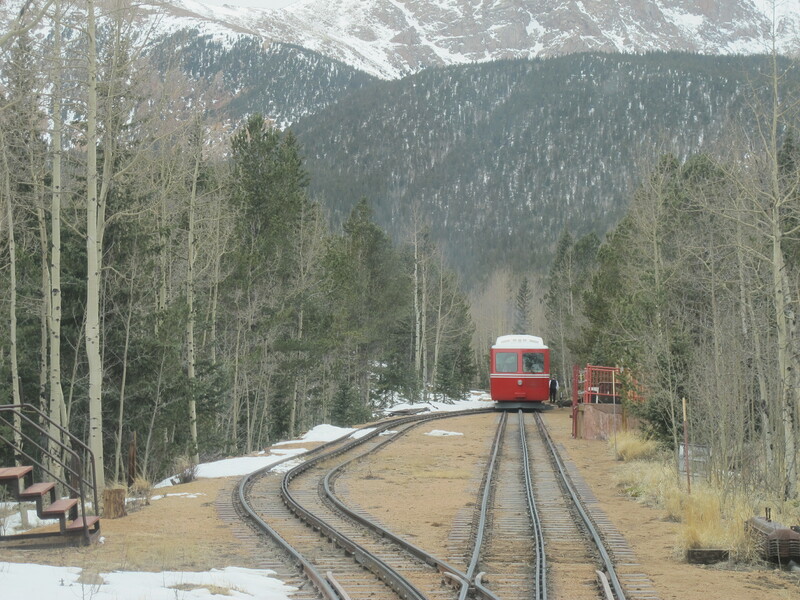 Recently I rode the Manitou and Pike’s Peak Cog Railway to the top of the mountain that Zebulon M. Pike didn’t summit on his 1806 expedition – although it bears his name. It was a chilly, overcast late winter/early spring day as we rode in cozy comfort up the 25 percent grade to reach the top in only an hour and a half. But Pike never made the summit. 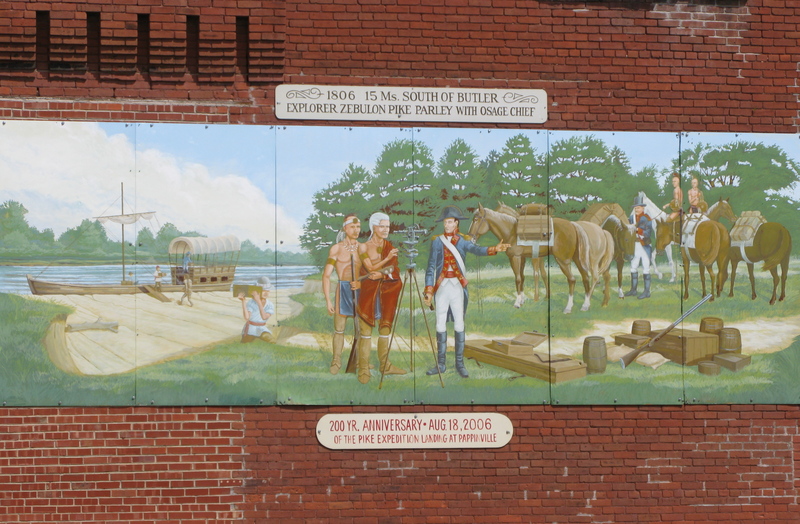 The town of Butler, Missouri, commemorates the ceremonial meeting in a mural on the town square. He and his men did not return – but his name and the commanding view he sought remain. 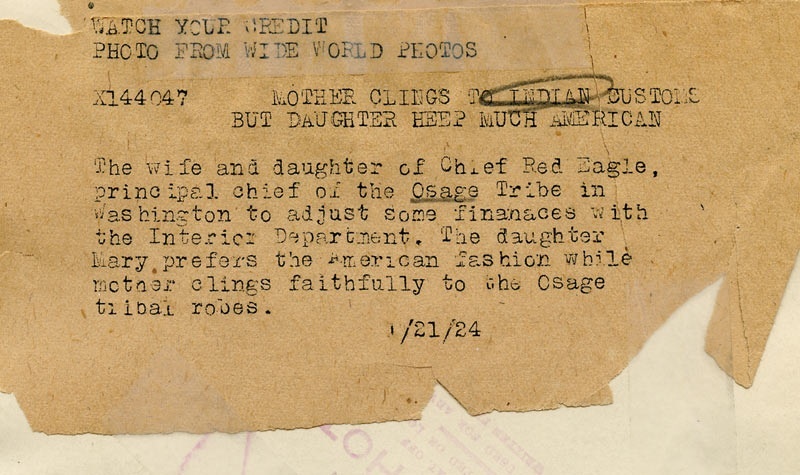 Caption reads: Mother clings to Indian Custom, but Daughter … much American: The wife and daughter of Red Eagle, Principal Chief of the Osage Tribe, in Washington to adjust some finances with the Interior Department. 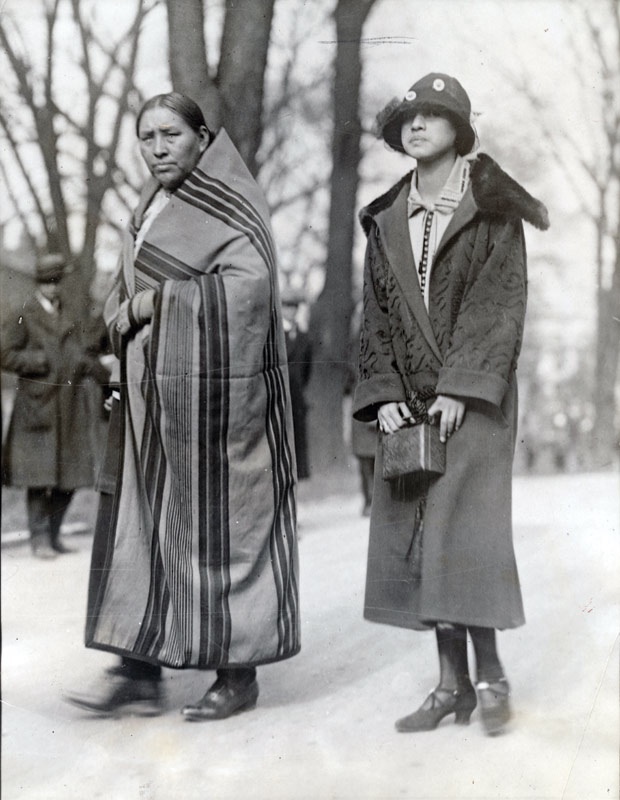 The daughter, Mary, prefers the American fashion while mother clings faithfully to the Osage tribal robes. Possibly Chief Red Eagle is Paul Red Eagle who was Chief from 1923-24, following Chief Ne-Kah-Wah-She-Tun-Kah’ who died while in office. Since the 1890s the Osage tribe had had substantial income derived from the sale of drilling rights to oil discovered on their lands. “With extraordinary foresight, the tribe had reserved subsurface mineral rights even though the land had been allocated among the 2,229 enrolled Osages.” (page 280, Damming the Osage). Money generated by the sales of drilling rights made enrolled Osages “probably the wealthiest people on earth” (New York Times November 18, 1898). Having had great wealth and the advantages of wealth – many Osages traveled the world and pursued higher education, modern houses, fashion, and automobiles; others maintained their Osage cultural lifestyle, language and traditions. One who maintained the cultural lifestyle was Paul Red Eagle. 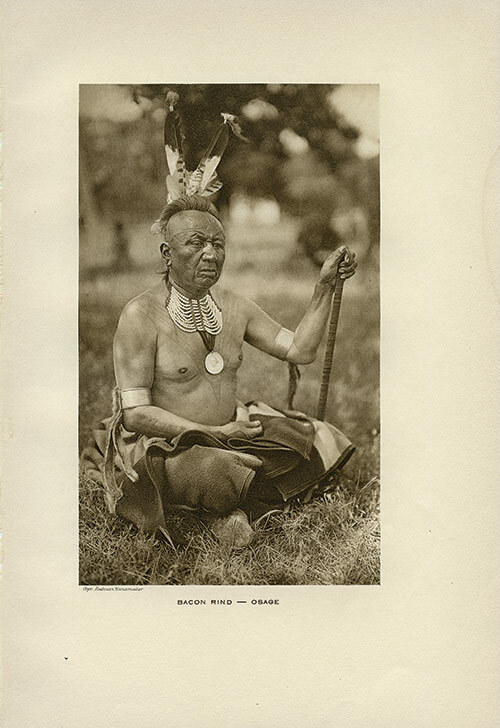 For ninety years Red Eagle had lived among his people. For that many years of constant changes, contacts and shifting scenes, he remained an Indian; thinking Indian thoughts and dreaming his own dreams. In his later years he seemed to be waiting for something. He lived quietly on this ranch preferring his horse to a car until his eightieth year. He had oil royalties but desired to live in simplicity. He had seen many things and had taken part in the wars in the southern part of the state; he talked of these wars with members of the tribe. 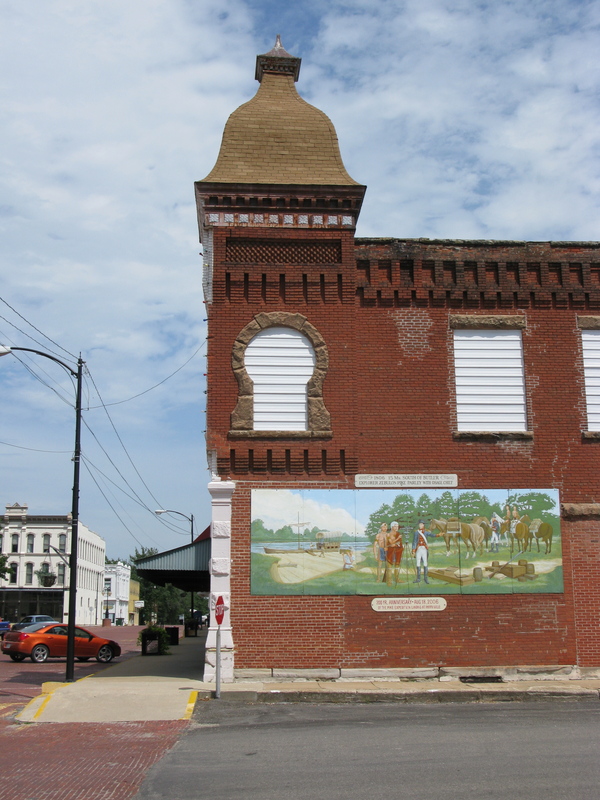 He saw brick buildings rise up among the jack-oaks and his nation spanned with roads, some of them sinuous black ribbons winding over sandstone ridges and limestone prairie. He watched with passivity, shiny oil derricks spring up like phantasmal fungi from valleys, wooded hills and prairie. Yet, with him remained the spirit of his fathers. To the end he remained an Indian. Frenzied wealth seeking and confused material progress did not disturb the soul of Red Eagle. His handsome face has been moulded in bronze and his picture painted by great artists. His face appears on programs, on brochures and as letterheads. His name, an unimaginative interpretation, is known everywhere, and is invariably associated with the word, Osage. This image of Wah Tze Moh In clearly illustrates Mathews’ description. 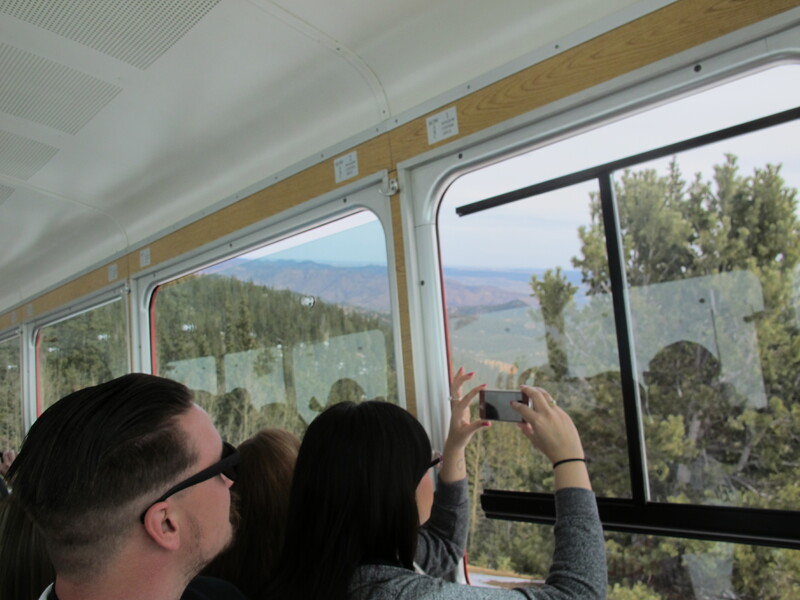 The photograph was taken during one of three photo expeditions sponsored by department store magnate, Lewis Rodman Wanamaker. Wanamaker was a man of many interests, supporting the arts, education, golf and athletics, and Native American scholarship. Between 1908 and 1913 he funded expeditions with photographer Joseph K. Dixon, to document “The Vanishing Race” – the American Indians. This is a third edition photogravure, dated 1925. Lookout was Principal Chief for three terms, serving a record twenty-eight years, much of it during the turbulent oil boom. He attended Carlisle Indian Industrial School in Pennsylvania, but spoke only Osage while conducting tribal business. 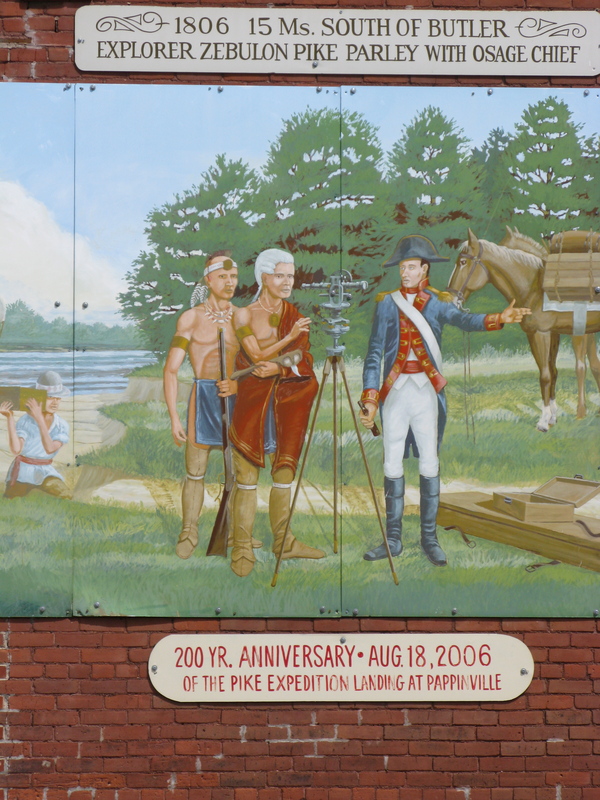 His wife Julia was a descendent of PA-HIÚ-ÇKA (White Hair) whose grave on Blue Mound near the upper Osage River was desecrated after the tribe departed for Kansas. 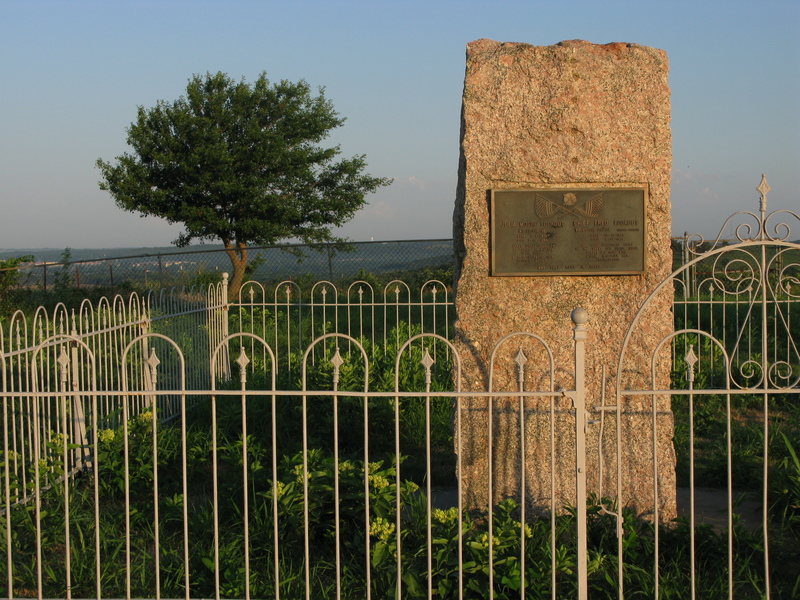 Their resting place is on a high hill east of Pawhuska, Oklahoma with a panoramic view of Osage County. 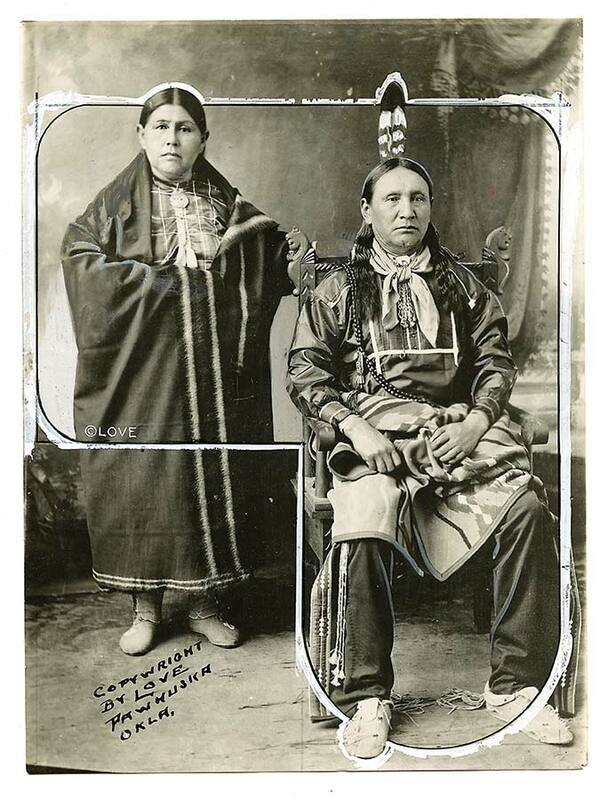 CHIEF FRED LOOKOUT, WA-NŐ-SHE ZHIʺ-GA Born 11-17-1861; Died 8-28-1949. The last hereditary Chief of the Great and Little Osage served his tribe with wisdom, integrity and faithfulness. We couldn’t fit this one into the book, but it is definitely an unusual image. While Harry Truman was born in Lamar, not terribly far from the stronghold of the Osage Indians, we haven’t seen any association of President Truman and the Osage Nation. The “Land of the Osage” is not, by the way, just a few counties. It included all of southern Missouri and northern Arkansas, and considerable amount of eastern Kansas and Oklahoma before they were exiled to northeast Oklahoma. What Harry or Lamar had to do with this we are unsure. Puzzling. Fort Osage, a 72 minute B movie from Monogram Studio,has Red Cameron guiding a wagon train through Indian Territory. The Osages are unhappy with the Anglo-Saxon immigrants because of the treating-violating proclivities of the white men. Not that Hollywood was known for authenticity in their portrayal of Indian life, but their scripts of Osages are both particularly inauthentic and rare. The Osage tribe had two headline grabbing periods. 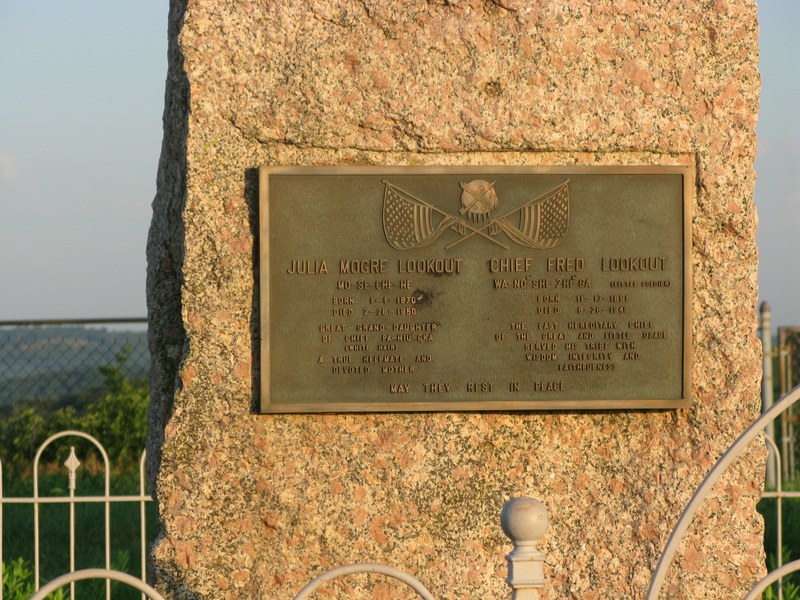 The first came before they moved out of their homeland on the Osage River. Their military power was a great concern to President Thomas Jefferson. The second came when they became oil-rich in the 1920s. They were frequently covered by the media. Unlike western Plains tribes, they never fought the cavalry and have thus escaped cinematic treatment.